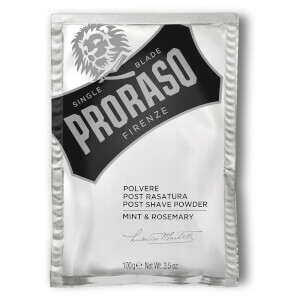 Achieve a smooth, clean finish with Proraso Post Shave Powder, a weightless formula that aids in reducing irritation and redness after shaving. Infused with a refreshing scent of Mint, Bergamot and Clove, the powder helps to absorb excess moisture and create a soft skin texture. Free from parabens, silicones, mineral oils and artificial colourings.